Text by Philip Halling, January 2013 ; This work is dedicated to the Public Domain. Croome Court stands in parkland in south Worcestershire; the house was designed by Capability Brown and Sanderson Miller, with Robert Adam designing the interior. An earlier seventeenth century house which stood on the same site was partially demolished to make way for the new house. Capability Brown is better known as a landscape gardener and after working at Stowe in Buckinghamshire, he was commissioned by the sixth Earl of Coventry to landscape the parkland surrounding Croome Court, turning wet marshy land in to a beautiful landscape park. This included damming a stream to create an artificial lake known as Croome River, a serpentine shaped lake echoing the River Severn to the west. The landscaping included the planting of numerous trees and the building of a number of follies which are described as ‘eyecatchers’ as their purpose was to catch the eye of visitors to the court. Capability Brown’s landscaping proved very popular and he went on to landscape many country parks and gardens throughout the country, including Chatsworth and Blenheim Palace. The National Trust took over the landscape park around Croome Court in 1997 and since then have undertaken a major restoration project to recreate Capability Brown's park. Each June the fields to the north of the court are a sea of Moon Daisies. Croome Court was built in the 1750s for the 6th Earl of Coventry, replacing an earlier house and demolishing a church which stood somewhere between the present court and Croome River to the west. The Coventry family sold Croome Court in the 1940s, for many years until the late 1970s it was a school. 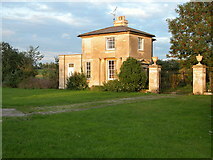 The house was in private ownership, however, in December 2007, it was purchased by the Croome Heritage Trust. The National Trust have leased the property on 999 year lease and opened the house to the public in September 2009. The present Croome Court was built in the mid eighteenth century for the 6th Earl of Coventry to a design by 'Capability' Brown. An earlier house stood on the site and remains at the core of this house. The classic view of Croome Court with the Croome River in the foreground and Croome D'Abitot church on the bank in the background. The classic view of Croome Court on a misty October morning, the tower of Croome D'Abitot church can be seen in the background. The mute swan is one of many swans on Croome River this morning, whilst walking beside this water feature I also saw a little egret, kingfisher and many other species. Swans silhouetted in morning mist on Croome River. Canada geese enjoying at open ground beside the lake in Croome Landscape Park, Croome Court can be seen in the background with the Red Wing, the former kitchen quarters under protective scaffolding on the right. Over the years a number of monarchs have visited the house, including George III, Queen Victoria and George V. During the Second World War it was home to the Dutch Royal family, who were in exile from Nazi occupation of Holland. Also, during the war, land immediately to the east of the park was used to build Defford Airfield. This airfield played a significant role in the development of Radar technology and was the site of the first blind landing. The airfield closed in the 1950s and is now used as a satellite station and West Mercia Constabulary lease part of the former airfield. Viewed from Croome Park, the former WWII Defford Airfield is now the site of a satellite station. After the war in the late 1940s the Coventry family had to sell the court, the 10th Earl had been killed at Dunkirk in 1940. His son became the 11th Earl of Coventry and lived in nearby Earl’s Croome Court until his death in 2002. Without a surviving heir, his only son had died in 1997, Earl’s Croome Court was sold after being in the Coventry family since the early seventeenth century. Until his death in 2002 this was the home of the 11th Earl of Coventry, the house had been in the Coventry family since the 17th century. After the death of the 11th Earl the house was sold. After Croome Court was sold in 1948 the house was a school until 1979 when the school closed and the court was purchased by the International Society for Krishna Consciousness (ISKCON). During this time Croome it was renamed Chaitanya College. In June 1984, ISKCON sold Croome Court and it remained empty for a number of years, the fate of the house and its park hanging in the balance. One proposal was to convert the house into a hotel and turn the parkland into a golf course. It was at this time that the National Trust became concerned as they feared Capability Brown’s first creation could be lost forever. At the time the land was owned by an insurance company, however, the trust was able to acquire the park and received a generous gift from the insurance company. This was 1997 and the National Trust commenced a ten project to restore the parkland and return it as much as possible to how it might have looked in the mid 18th century. This was a major task, particular as in recent years the land had been under arable use, and not helped by the fact that in the early 1960s the M5 motorway cut a swathe through the park. When the National Trust acquired Croome Park this didn’t include Croome Court which was owned and lived in by a property developer. In 2007, the Croome Heritage Trust purchased the court with the aid of grant from the Heritage Lottery Fund. Croome Court is now leased to the National Trust and first opened to the public in September 2009. Visitors hoping to see the house complete with furniture will be disappointed, some of the former contents which remained after the sell off after World War II are on display at Kelmarsh Hall in Northamptonshire. The longer term aim is to return pictures and furniture to Croome Court. The contents of one room, the Tapestry Room were sold by the 9th Earl in the early 20th century to a dealer in Paris. This included the ceiling, mahogany doors and surrounds, carved chair rails, chimneypiece and floors. All was later acquired by the Samuel H. Kress Foundation in 1949. In 1958, the Foundation gave it all to New York’s Metropolitan Museum. The Long Gallery occupies the entire depth of the house on the west end. The room has a magnificent plaster ceiling designed by Robert Adam. This plaster ceiling in the Long Gallery of Croome Court was designed by Robert Adam. 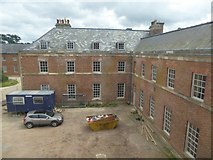 The Red Wing, a red-brick building adjoining Croome Court was built as the servants’ quarters and when the court was purchased by the Croome Heritage Trust in 2007 the Red Wing was not included. 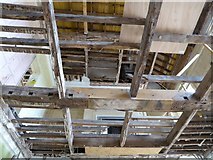 The building was in a parlous state and in urgent need of restoration. Eventually in 2011 the Grade 1 listed building was purchased and hopefully it future is more secure. The Red Wing adjoins Croome Court and was once the servants quarters. The Court was purchased by the Croome Heritage Trust in 2007, however, the Red Wing remains in private ownership and as can be seen is suffering and in urgent need of repair. Viewed through the window from within Croome Court. After years of neglect and decline the Red Wing adjoining Croome Court has been purchased and is now under scaffolding awaiting restoration. Here it is viewed through one of the windows in Croome Court. Having acquired the Red Wing the National Trust has repaired the roof to protect the structure of the building any prevent and further deterioration of the building, though there are currently no funds available for internal restoration of the building. The interior of the Red Wing of Croome Court. This building was acquired by the National Trust in 2011, at the time it was in a dire state with the roof open to the elements. The roof has been repaired but at present there are no funds to restore the interior. One of the rooms in the Red Wing of Croome Court. This building was acquired by the National Trust in 2011, at the time it was in a dire state with the roof open to the elements. The roof has been repaired but at present there are no funds to restore the interior. The church of Croome D'Abitot is dedicated to St Mary Magdalene. Inside the church there are a number of tombs to the Earls of Coventry from nearby Croome Court. The church was built in the middle of the eighteenth century and replaced an earlier church which was located adjacent to the present Croome Court. Evening sun lighting the tower of Croome D'Abitot church, viewed here from the west. The church was built in the 1750s, part of 'Capability' Brown's landscaping of Croome Park for the 6th Earl of Coventry. This church replaced an early church which was situated near Croome Court. This Grade I listed building was built in 1763 by Capability Brown for the Earl of Coventry. The original medieval church which was situated adjacent to the previous 17th century house was demolished, and this replacement was built on rising ground to the north east of the new house. The interior of the church was designed by Robert Adam. Some of the seventeenth century family memorials were transferred from the original church. This church is in the care of Churches Conservation Trust. Within the church there are a number of memorials to members of the Coventry family. Effigy of Thomas, 1st Lord Coventry who was Lord Keeper to Charles I, who died in 1639. In front of the effigy is a cushion and a mace. This monument was originally placed in old Croome Church and moved to this newer church when it was built as a replacement in the 18th century. A reclining effigy of the 2nd Lord Coventry who died in 1661. The effigy of the 4th Lord Coventry reaches out to the figure of Faith who used to hold a crown. Unfortunately the crown was lost when the monument was moved from the old church to the new church in the 18th century. Monument in St Mary's Church, Croome D'Abitot to the 4th Lord Coventry who died in 1687. The monument which was originally placed in the earlier church was sculpted by Grinling Gibbons. Effigy of Mary, wife of the 2nd Lord Coventry, who died in child birth in 1634. Interestingly one of the finest memorials, that of the 1st Earl of Coventry is not in this church. Due to a family dispute the memorial was placed in Elmley Castle church a few miles to the east of Croome. The 1st Earl of Coventry's country seat was Croome Court and this magnificent memorial was meant to be placed in Croome church. The memorial was sculpted by William Stanton for the earl's widow and second wife Elizabeth (nee Grimes). However, due to a dispute between the earl's sons and their step-mother, the Coventry family wouldn't allow the memorial to be placed in the church at Croome. The dispute arose after the death of the earl's first wife, Winifred, and a year later in 1695 he married Elizabeth, one of his servants, who at 25 years old was more than forty years his junior. She was the niece of his house keeper and the sister of a Thames waterman. She claimed her name was Elizabeth Graham. After the death at 70 of the 1st Earl on 15 July, 1699, she inherited a large amount of his estate and within a few months married Thomas Savage of Elmley Castle, hence the memorial tomb of her first husband was placed in Elmley Castle church. The Rotunda in Croome Landscape Park was designed and built by Lancelot ‘Capability’ Brown between 1754-7. Croome Landscape Park in now in the care of the National Trust. The Rotunda stands on rising ground to the east of the house; it was designed by Capability Brown and built between 1754-7. The Park Seat, also known as the Owl’s Nest, was designed by Robert Adam and built between 1770-2. It stands in Croome Landscape Park at the southern end of Croome River. The park in now in the care of the National Trust. Better known as the Park Seat it was built in 1770-2 by Adam and has recently been restored. It is situated at the southern end of the park, overlooking the parkland and Croome River. The Pershore gate to Croome Court is better known as the London Arch. The arch was designed by Robert Adam in 1759, it possibly is based on the Roman Arch in Pula which Adam saw in 1757, though it is more likely to be inspired by the Temple of the Sun at Palmyra. The Pershore gateway is known as the London Arch and was the main entrance to the house. The arch was designed by Robert Adam in 1759; it resembles the Roman arch at Pula in the Balkans, though it is thought it is inspired by the Temple of the Sun at Palmyra. There used to be railings either side, though these were most likely removed during the war for ammunition. These gates now provide private access to the privately owned residential court mews. Croome Court reflected in the waters of Croome River. Croome River is in fact not a river at all but a landscaped serpentine lake created in the mid-18th century by Lancelot 'Capability' Brown for the 6th Earl of Coventry. This bridge was structurally weak and was replaced in early 2013 by a more robust wooden bridge SO8844 : Brand-new footbridge SO8844 : New footbridge in Croome Park, better able to cater for the number of visitors to Croome Park. The National Trust acquired Croome Landscape Park in 1997 and had a ten year restoration project which included dredging Croome River which was becoming choked with reeds as is evident here. Trees reflected in Croome River which was created in the eighteenth century by 'Capability' Brown when he landscaped the parkland for the 6th Earl of Coventry. Designed by Capability Brown in 1765, originally this Grotto was decorated with cystals, fossils, shells and corals, though over the years these have been plundered. Since this picture was taken in 2005, some restoration has been carried out by the National Trust. The grotto and various features were designed by Capability Brown. Due to years of neglect the lake, known as Croome River, was silting up and part of the National Trust’s restoration involved removing 50,000 cubic metres of silt and vegetation from the lake. Nearby are the Punch Bowl gates designed by Wyatt in 1793 to 1794. On one of the islands in the lake is the temple pavilion (1776-7). Island Temple in Croome Park was built in 1776-7, though there is some doubt as to the architect, Capability Brown is believed to be the most likely designer however there is a possibility it may have been Robert Adam as he submitted a bill to Lord Coventry at the time. It is unclear if the bill was for this temple or Park Seat, which is also known as Owl's Nest and stands at the southern end of the park. There is some doubt as to the designer of the Island Temple which is believed to date from 1776-8. Capability Brown is the most likely designer though bills from the time indicate it could be designed by Robert Adam. In 1778, Coade plaques were added to the inside walls. Island Temple is a Grade I listed building. Temple Greenhouse was built in 1763 to a design by Robert Adam for the 6th Earl of Coventry who grew exotic plants in it. Designed by Robert Adam and completed in 1763, the Temple Greenhouse housed the Earl's collection of exotic plants. During the winter it was heated by a fire lit in a brick bothy at the back, and then the heat was channelled underneath through gaps in the floor. This building has undergone restoration with the replacement of large sash windows to the front (pictured before restoration). For many years they were missing. The Temple Greenhouse is a Grade I listed building. Situated on Knight's Hill, this Grade I listed building was designed by James Wyatt in 1801, though it was based on an earlier design by Robert Adam. Construction began in 1805 and it was not completed until 1812, three years after the earl’s death in 1809. The National Trust purchased the Panorama Tower in 2009 and have since restored it. Standing in a prominent position this folly is clearly visible to those passing by on the M5 motorway. This eyecatcher folly stands on rising ground known as Rabbit Bank, to the north of the park. It was purchased by the National Trust in 2009 and was restored. Prior to restoration it was in urgent need of repair with thick ivy growing on it (pictured here before restoration). Standing almost a mile to the south of Croome Court is Dunstall Castle; it is situated on Dunstall Common beside a minor road. When built it was visible from Croome Court, though today it is hidden from view by a narrow strip of woodland known as The Belt. Designed by Robert Adam, this eyecatcher folly was built between 1766-7. Over the years this folly deteriorated and some of the masonry had fallen from the three towers. A turret from the central tower had completely collapsed. The National Trust purchased this folly in 2009 and have restored it and replaced the missing central turret. The low winter sunshine casting a long shadow of Dunstall Castle across Dunstall Common below. Just visible in the distance is the Rotunda Tower and to the left partially obscured by trees is Croome Court. After many years of neglect Dunstall Castle, a folly designed by Robert Adam in 1766/7 for the 6th Earl of Coventry, was acquired by the National Trust and restored. The restoration work included rebuilding the observation turret which had collapsed many years ago. Here the internal brickwork and the castellations of the restored tower can be seen. The Worcester Gate lodge dates from 1801, and rebuilt in 1879. This lodge was beside the entrance to the drive from the west. The construction of the M5 motorway cut this lodge off from the main parkland. Broadway Tower pictured here on a very clear summer evening, it is supposed to be possible to see thirteen counties from the tower. The view in the background includes much of northern Worcestershire and beyond to the West Midlands. Though not at Croome, Broadway Tower was built for the sixth Earl of Coventry to a design by James Wyatt in 1799. The tower was built on the Spring Hill estate, then owned by the earl. It was said that a beacon was lit at the top of the tower to warn those at Croome of the imminent arrival of Lord Coventry when returning from London. The Spring Hill estate was sold by the Coventry family in the nineteenth century; now in Broadway Tower Country Park, the tower is open to the public. These cottages are built in a familiar architectural style and can be found in a number of villages in south Worcestershire as they were built by the Croome Estate. They were built over a period of years through the late nineteenth and early twentieth centuries during the life of the 9th Earl of Coventry. The large Croome estate owned land in many parishes and built cottages such as these and today many of the now privately owned estate cottages are evident such as these in Earl’s Croome. Like many aristocratic families, along with their country estate they also had a house in London, though in the case of the Earls of Coventry the house, which was situated on Piccadilly, was sold off many years ago. At present 106 Piccadilly the London campus of 'Limkokwing University of Creative Technology' Link At the time the picture was taken in 2006 the building housed an international language centre. The house used to be the London home of the Earl's of Coventry, the 6th Earl of Coventry bought the house in 1764 from Sir Henry Hunloke for 10,000 guineas. Sir Henry had had the house built in 1761, the architect is unknown though it may have been Matthew Brettingham the Elder. It is situated next to the Park Lane Hotel opposite Green Park. By the mid nineteenth century the Coventry family had abandoned their London residence and in 1878 it became the home of the gentlemens StJames's Club.